Avista has been helping customers conserve energy for more than 40 years by providing rebates on energy-saving equipment for your home. You will also find energy-saving tips and do-it-yourself videos by going to myavista.com/efficiencymatters. Your Local Toyota Dealers are proud to give away the first ever All-Wheel-Drive Prius, designed to provide traction up to 43mpg, with a manufacturer-estimated combined 50mpg1. Plus, the 2019 Prius comes standard with Toyota Safety Sense technology, keeping you and your family safe on the road. Not to mention, Prius’ iconic looks suits any setting, from your off-road adventure, to your daily commute. Its sleek lines, active grille shutter, and aero stabilizing fins and underbody panels all work together to smooth airflow, which in turn helps maximize fuel efficiency. Take a test drive at any of your local Toyota dealers today, or shop BuyaToyota.com. 12019 EPA-estimated 52 city/48 hwy/50 combined mpg estimates for Prius LE AWD-e. Actual mileage will vary. KREM 2 is On Your Side. That means when you have questions, we get answers. We question those answers to find out if they are true or false. We report on stories that matter most to you. Our Storm Tracker 2 team is always tracking the weather, keeping an eye out for storms. Always giving you an accurate forecast so you can plan your day around the weather. KREM 2 is the leader in providing critical information to the Inland Northwest on-air, online, and on all social platforms. Eligibility: Subject to the additional restrictions below, the Efficiency Matters Sweepstakes (the “Sweepstakes”) is open to legal U.S. residents of the states of Washington and Idaho who are 18 years or older at the time of entry (“Entrant(s)”). Employees and contractors of KREM-TV (“Sponsor”), TEGNA Inc., Avista Corporation (“Avista”), Inland Empire Toyota Dealers, and each of their respective affiliated companies, and advertising and promotional agencies, and the immediate family members of, and any persons domiciled with, any such employees or contractors, are not eligible to enter or to win. How to Enter: The Sweepstakes will begin at 12:00 a.m. (P.T.) on Monday, April 22, 2019 and end at 11:59 p.m. (P.T.) on Sunday, June 2, 2019 (the “Sweepstakes Period”). There are two places to obtain Daily Keywords – by watching KREM 2 news and on Twitter. There are three places to obtain Bonus Keywords - on KREM’s Facebook page, KREM’s News 2 Know Newsletter, and Avista’s website (see below). Enter online by visiting the Efficiency Matters Sweepstakes official registration page on the KREM.com website and completing all of the required information on the entry form, including a valid Keyword, and following all posted instructions. Submit your entry by clicking on the “SUBMIT” button and entries will be deemed received upon electronic receipt. Each Entrant may enter daily and each entry must include a valid Keyword. All entries must be received electronically by clicking “SUBMIT” by 11:59 p.m. on Sunday, June 2, 2019. Alternatively, mail (no more than one-hundred  times during the Sweepstakes Period) your First Name, Last Name, Birthdate, Address, City, State, Zip, Phone Number, Email Address, and Keyword to Win a Prius, P.O. Box 2230, Coeur d’Alene, ID 83816. All entries must be received by 11:59 p.m. on Sunday, June 2, 2019. On-Air: Watch any of the KREM 2 Newscasts on KREM 2 at 5am, 6am, 12pm, 4pm, 5pm, 6pm, 630pm, and 11pm each day, or any of the KREM 2 Newscasts on KSKN 22 at 7am, 8am, and 10pm each day, during the Sweepstakes Period, to obtain the “Efficiency Matters” Daily Keyword. A new daily keyword will air each day for a total of 42 keywords. Follow the directions above to enter the Daily Keyword on the Sweepstakes official registration page, each day during the Sweepstakes Period. Daily Keywords will be valid from 12:00am through 11:59pm each day (“Daily Entry Period”). Only one (1) Daily Keyword entry per person per Daily Entry Period. On Twitter: @KREM2 will tweet a Daily Keyword at #WinAPrius (this keyword is different from the on-air Daily Keyword airing in the newscasts). A new daily keyword will be tweeted each day for a total of 42 keywords. Follow the directions above to enter the Daily Keyword on the Sweepstakes official registration page, each day during the Sweepstakes Period. Daily Keywords will be valid from 12:00am through 11:59pm each day (“Daily Entry Period”). Only one (1) Daily Keyword entry per person per Daily Entry Period. Maximum of 84 total Daily Keyword entries (1 On-Air entry per day + 1 Twitter entry per day) per person during the Sweepstakes Period. One (1) Bonus Keyword will be displayed, during the Sweepstakes Period, in a tab on the KREM 2 News Facebook page www.facebook.com/KREM2. This Bonus Keyword may be used for one (1) bonus entry per person during the Sweepstakes Period. Four (4) Bonus Keywords will be displayed, during the Sweepstakes Period, in sponsored Facebook posts with embedded videos that will be posted via the KREM 2 News Facebook page www.facebook.com/KREM2. These Bonus Keywords may be used for four (4) bonus entries per person during the Sweepstakes Period. Five (5) Bonus Keywords will be displayed, during the Sweepstakes Period, in the KREM 2 News 2 Know Newsletter. These Bonus Keywords may be used for five (5) bonus entries per person during the Sweepstakes Period. One (1) Bonus Keyword will be displayed by 10 am PDT each Monday, during the Sweepstakes Period, on the Avista website at www.myavista.com. This Bonus Keyword may be used for one (1) bonus entry per week, per person, for a total of six (6) entries during the Sweepstakes Period. Maximum of 16 total Bonus Keyword entries per person during the Sweepstakes Period. Each Entrant may enter using only one (1) email address. Multiple Entrants are not permitted to share the same email address. Your computer must accept cookies, or any successor or similar technology, which may be used for the purpose of entry tracking. Ad blocking software on your computer needs to be disabled so that it doesn’t interfere with processing your entry. By entering, you agree to the terms of these Official Rules and to receive e-mails from Sponsor or those directed by Sponsor. You can opt-out of the receipt of such e-mails by following the directions on the Sweepstakes website or in any email received from Sponsor. All entries become property of Sponsor and none will be returned. Winner Selection: On or about Monday, June 3, 2019, ten (10) finalists will be selected by a random drawing at KREM-TV from all eligible entries received during the Sweepstakes Period. The ten (10) finalists will be required to attend the Efficiency Matters Finale Event on Monday, June 10, 2019 at Riverfront Park, 507 N Howard St, Spokane, WA 99201 where the Grand Prize Winner will be selected in a live random drawing. The Finalists not selected as the Grand Prize Winner in that random drawing will be the Runner-up Winners. Travel expenses to the Efficiency Matters Finale Event are not included. If a finalist is not present at the Efficiency Matters Finale Event, he or she will forfeit their chance to be the Grand Prize Winner or to win a Runner-Up Prize. Sponsor shall have no further obligations to that finalist. 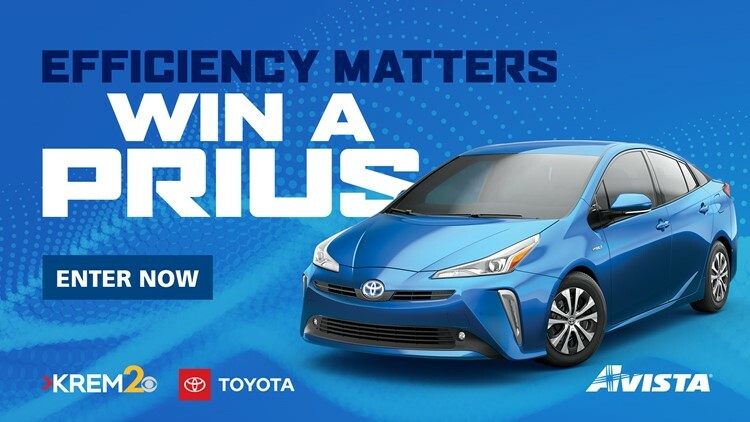 Prizes and Odds: One (1) Grand Prize: All-New 2019 Prius LE AWD-e of Inland Empire Toyota Dealers’s choosing from its available stock (Approximate retail value $27,578). Up to Nine (9) Runner-Up Prizes: $200 Avista Utilities credit to be used towards his or her monthly Avista Utilities bills (Approximate retail value $200 each). Odds of winning depend on the number of eligible entries received from all means of entry. Winner Notification and Acceptance: Finalists will be notified on or about Monday, June 3, 2019 at the telephone number or at the email address provided on finalist’s entry form. Sponsor will call during regular business hours at number provided on entry form. Failure to reach finalist by phone after three (3) attempts, return of email as undeliverable, or failure of finalist to respond to notification, may result in disqualification of finalist, forfeiture of his or her interest in all prizes, and selection of a substitute finalist from among all remaining eligible entries. Winners may waive their right to receive prizes. Prizes are nonassignable and nontransferable. No substitutions allowed by winner. Prizes are not redeemable for cash. Prizes and individual components of prize packages are subject to availability and Sponsor reserves the right to substitute prizes of equal or greater value. Winners are solely responsible for reporting and payment of any taxes on prizes. Winners may be required to complete an affidavit of eligibility/liability and publicity release which must be returned as directed by Sponsor. Failure to sign and return the affidavit or release, or to comply with any term or condition of these Official Rules, may result in a winner’s disqualification, the forfeiture of his or her interest in the prize, and the award of the prize to a substitute winner. Except where prohibited, acceptance of any prize constitutes winner’s consent to the publication of his or her name, biographical information and likeness in any media for any commercial or promotional purpose, without limitation the Internet, or further compensation. Prizes not won and claimed by eligible winners in accordance with these Official Rules will not be awarded and will remain the property of Sponsor. The Grand Prize will be available for pick up at an Inland Empire Toyota Dealer no later than June 20, 2019. Grand Prize Winner must provide proof of insurance and have a valid driver’s license to take delivery of the vehicle and must take delivery at an Inland Empire Toyota Dealer by June 20, 2019. Travel expenses to the dealership to take delivery of the car are not included. The Grand Prize Winner will be solely responsible for insuring and registering the vehicle, in addition to all vehicle title, license and registration fees, freight, sales tax, delivery, dealer prep, emissions inspection, additional equipment, insurance, gasoline, maintenance and all other fees and expenses associated with the receipt and use of the vehicle. The interior/exterior colors of and specific package details of the vehicle to be determined by Inland Empire Toyota Dealers. Any vehicle options and/or upgrades above the package chosen by Inland Empire Toyota Dealer are not part of the Grand Prize and will be the Grand Prize Winner’s sole responsibility. A standard manufacturer’s vehicle limited warranty is included. Grand Prize Winner agrees that the Sponsor has neither made nor is responsible or liable for any warranty, representation or guarantee, express or implied, in fact or in law, relative to the vehicle, including but not limited to its quality, mechanical condition or fitness. Participation: By participating, Entrants agree to be bound by these Official Rules and the decisions of Sponsor. Sponsor reserves the right to disqualify persons found tampering with or otherwise abusing any aspect of this Sweepstakes as solely determined by Sponsor. In the event the Sweepstakes is compromised by circumstances beyond Sponsor’s reasonable control, a virus, non-authorized human intervention, tampering or other causes beyond the reasonable control of Sponsor which corrupts or impairs the administration, security, fairness or proper operation of the Sweepstakes, Sponsor reserves the right in its sole discretion to suspend, modify or terminate the Sweepstakes. Should the Sweepstakes be terminated prior to the stated expiration date, Sponsor reserves the right to award prizes based on the entries received before the termination date. Sponsor will not be responsible for incomplete, lost, late, misdirected or illegible entries, or for failure to receive entries or other electronic communications due to transmission failures or technical failures of any kind, including, without limitation, malfunctioning of any network, hardware or software, whether originating with sender or Sponsor. The authorized account holder of the e-mail address submitted at time of entry will be considered the Entrant. An “authorized account holder” shall mean the natural person assigned to such e-mail account by the Internet access provider, online service provider, or other organization responsible for assigning e-mail addresses for the domain associated with such e-mail account. A potential winner may be requested to provide proof that he or she is the authorized account holder of the e-mail address associated with a winning entry. In the event of a dispute, all online entries will be deemed to have been submitted by the owner of the ISP account from which they were sent. For these purposes, an ISP account holder shall mean the natural person assigned to such ISP account by the Internet access provider, online service provider or other organization responsible for assigning ISP addresses for the domain associated with such ISP account. Any questions regarding the number of entries or votes submitted by the owner of an ISP account shall be determined by Sponsor in its sole discretion. Release: By participating in this Sweepstakes, each entrant agrees to fully release forever discharge and hold harmless Sponsor, TEGNA Inc., Avista Corporation, Inland Empire Toyota Dealers, Twitter, and Facebook from and against all claims, costs, liabilities, losses, injuries and damages arising out of the Sweepstakes, including, but not limited to, any claims for person injury, death or damage to or loss of property or any other harm arising out of entrant’s participation in the Sweepstakes, the receipt, use, or misuse of any prize, or any travel or activity that is related to the Sweepstakes or any prize. This Sweepstakes is in no way sponsored, endorsed or administered by, or associated with Facebook or Twitter, or Snapchat. Sponsor: The Efficiency Matters Sweepstakes is sponsored by KREM-TV. The decisions of Sponsor regarding the selection of winners and all other aspects of the Sweepstakes shall be final and binding in all respects. Sponsor will not be responsible for typographical, printing or other inadvertent errors in these Official Rules or in other materials relating to the Sweepstakes. For a list of winners (available after July 16, 2019) or a copy of these Official Rules, send a self-addressed, stamped envelope to “Winners List/Official Rules” (as applicable), Efficiency Matters Sweepstakes, KREM-TV, 4103 S. Regal, Spokane, WA 99203. If you have any questions regarding this Sweepstakes, please contact ksantos@krem.com. These Sweepstakes are in no way sponsored, endorsed or administered by, or associated with Facebook or Twitter. By entering these Sweepstakes Entrant agrees to release Facebook and Twitter from any and all liability arising out of the Sweepstakes. Any information disclosed to Avista by Entrants in connection with these Sweepstakes will not be shared with Facebook or Twitter, but will only be used for communications related to these Sweepstakes.